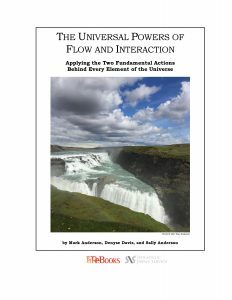 Flow and Interaction, the two fundamental elements of the universe, are constantly at work, continually shaping every aspect of our lives. Once we recognize, understand, and apply this concept, everything from medicine to finance, from the environment to security, can be seen as having shared foundations, properties, and mathematics. For three days each year, SNS members come together at the SNS Future in Review (FiRe) conference and share ideas about the near future, in the process forming new initiatives, alliances, and even companies. The theme of FiRe 2016, “The Power of Flow,” was offered to experts in more than a dozen fields to discuss where Flow and Interaction are found and how they drive discoveries in their own fields. This book is a compilation of their talks and conversations, beginning with Mark Anderson’s opening speech on the power of this discovery.